Rodney Koelmeyer had the honour of a private audience with His Holiness Pope Francis at The Papal Basilica of St. Paul in Rome on on 25th January 2014. Private Meeting on the 01st of October with a visionary Vicka Ivankovic-Mijatovic in Medjugorje. Mr & Mrs Rodney Koelmeyer of Superlink Travels paid a courtesy call on His Grace Archbishop Oswald Gomis at the Archbishops House Colombo. 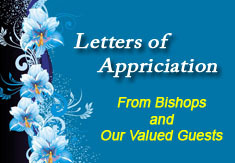 Mr & Mrs. Rodney Koelmeyer of Superlink Travels paid a courtesy call His Grace Archbishop Most Rev. 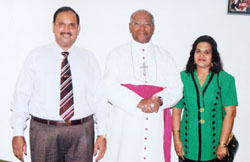 Dr. Malcolm Ranjith at the Archbishops House Colombo on 18th September 2009. Mr. Rodney Koelmeyer The President of IATA Agents Association- Sri Lanka and Chairman / Managing Director of Superlink Travels (Pvt) Ltd, with His Lordship The Chief Justice Asoka De Silva for the First ever IATA Agents Association Legends Awards Ceremony held at Ramada Hotel on the 01st October 2010.
of tourism and also for visiting Israel over 300 times with pilgrim groups. Mr. Rodney Koelmeyer, Chairman Managing Director of Superlink Travels (Pvt) Ltd., receiving the award for The Best Outbound Tour Operator in Sri Lanka for the year 2013 from Oman Air Mr. & Mrs. Rodney Koelmeyer of Superlink Travels (Pvt) Ltd., being welcomed by Mr. Alon Ushpiz, Ambassador of Israel and Mr. Wicky Wickramatunga, Honorary Consul of Israel at the 66th Independence Day Celebration held at The Kingsbury Hotel, Colombo, on 22nd of May 2014. Mr. Rodney Koelmeyer receiving the Janabhimani Honorary Noble Service Award from Hon. 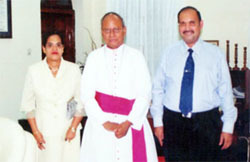 Karu Jayasuriya, Speaker of the Parliament of Sri Lanka, in the presence of Hon. Arjuna Ranatunga, Minister of Petroleum Resources Development and Mr. Suranga Ranjan, General Secretary, Independent Media Association of Sri Lanka at the Awards Ceremony held at the Bandaranaike Memorial International Conference Hall on the 15th of December 2017.